When you have been DX listening for almost 30 years, and have a collection of radio verifications from over 4500 different broadcast stations, it is not so easy to find new highlights on the AM band. This is the reason why I had been expecting solar minimum so much. Mediumwave conditions are excellent, and you can find previously unheard stations. Luckily this solar minimum was not an exception. Here are my personal highlights from the season 2007-2008. I have also added audio files of most of the stations mentioned in this short article. Please enjoy, some of the audio clips are astonishing. During the solar minimum 1986-87 I served in the military. The next minimum in 1996-97 was overloaded with work at my small new company and it was impossible to enjoy dxing as much as I would have wanted. So I promised myself that during this minimum I will concentrate all my efforts into listening. Well, naturally as an entrepreneur you can never leave the work totally, but we had recently hired an excellent managing director, and it was possible to leave the daily burden to him. 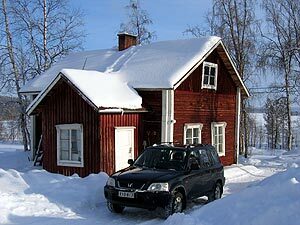 Actually I had decided to write a business book, which gave me the possibility to escape the daily hazzle, jump into the train and travel to Lemmenjoki, the radio listeners' paradise in Northern Finland. In Lemmenjoki I enjoyed the beautiful nature, relaxing atmosphere, writing the book and listening to distant radio stations. In September I spent one week alone in Lemmenjoki. The exact dates were September 15-23, which means that listening was concentrated only to sunrise and sunset. 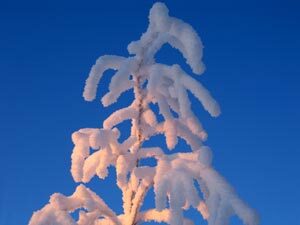 At daytime it is too sunny, thus no mediumwave signals are heard. Nighttime on the other hand is usually quite boring, unless Brazilians start coming in around midnight. This time they didn't. 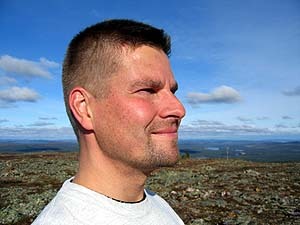 The writer smiling on top of Joenkielinen (534 meters). However, this week's sunsets were quite good, resulting in many new Asian stations. And sunrises - they were spectacular! The best of all was Saturday morning, the 22nd of September. On European dominated frequencies like 1440 and 1530 many interesting Central and South American stations were heard. Radio Impactante from the Dominican Republic dominated the frequency 1440 kHz, leaving no chance to European superpowers in Russia and Luxembourg. On 1530 kHz it was not Romania, as usual, but Ondas Cañaris from Azogues, Ecuador, and Radio Milenia from Lima, Peru (you can enjoy the clip by clicking the link). Especially Milenia's signal was fantastic: "Radio Milenia 1530" It is amazing that previously unheard stations (in Europe) can have signals like this. A week later, between 28th September and 6th October it was time to return to the DX paradise. Writing was proceeding well and mediumwave conditions were staying at an excellent level. Days were getting a bit shorter, so Asian stations were coming in earlier, and Trans-Atlantic stations stayed audible till mid morning. Now I was in Lemmenjoki with my good DX friend Håkan Sundman. It was the 9th DX-expedition we made together. Chinese stations, how I love them. Superpowers can of course be heard almost daily, but local stations are much harder. This time we had the chance to hear many unheard wonders, like Wuhai PBS (Wuhai People's Broadcasting Station) from Wuhai, Nei Menggu on 747 kHz, identifying even in English: "This is Wuhai Radio on 87.8 FM and 747 AM" and Jinzhou PBS from Jinzhou, Liaoning Province on 774 kHz identifying "Zhongbo 774 qianhe, Jinzhou Renmin Guangbo Diantai, zhongbo jinji guangbo, zhu nin wan an." We had been listening for 5 days, and were extremely happy with the results. But we couldn't even imagine what was going to happen. Something totally unbelievable. It all started at 1510 UTC on Thursday, the 4th October. Suddenly the mediumwave band was full of Aussies. The first one we noticed was on 1062 kHz, which is the frequency for ABC Far North Queensland in Thursday Island, Qld. The programming was ABC's 'Nightlife' with Tony Delroy, but nevertheless it was a once-in-a-lifetime experience. A few months later I learned that ABC Far North had made a short story about my reception report in their nationwide night programme. Please enjoy it here: ABC's Christmas Night programme. There is one more station I must mention: Cross Radio from Pohnpei, Micronesia on 4755 kHz shortwave. Rarely these days can you find new ones on shortwave, but every now and then there are real gems available. The Cross was definitely one of those most valuable treasures. Micronesia was also a new DX country for me and what made it so special was that one year earlier I had visited Micronesia. When island hopping between the four Micronesian states Chuuk, Pohnpei, Kosrae and Yap, I was dreaming that one day I will hear this country in Finland. That dream came now true - only 14 months later. Early November, the 3rd to the 11th, was extremely quiet in the sun. Days were getting very short, so it was possible to enjoy North American mediumwave stations from midnight till late afternoon, almost 18 hours a day. But despite the great DX conditions, when you have nearly 1000 verified North Americans, it is not easy to identify new ones. This week I was in Lemmenjoki with Lauri Niemi, to whom most of the stations were new. He was able to make over 220 reception reports that week. I had to satisfy myself with some 30 new stations. But I was satisfied, especially when some new stations had a fantastic reception quality. Take a listen to WLNO New Orleans, LA on 1060 at 2300 UTC, just before they reduce their daytime power from 50 000 watts to 5,000 watts. KJUG Tulare, CA on 1270 kHz was another highlight, as well as '1560 The Game', KGOW Bellaire, TX. Please enjoy these rare signals. Early December went on business trips to Moscow and Guangzhou, and the Christmas Eve was spent naturally at home, but after that it was time to return to Lemmenjoki again. The way this expedition started was out of this world. The morning hours on the 28th December we (Jari Ruohomäki and myself) experienced perhaps the best Brazilian conditions ever. We had many SDR-14 receivers, so we were able to cover almost the whole mediumwave band. Signals were astonishing between 0650 and 0750 UTC, meaning that most Brazilian stations were on the air already. Those stations which are silent at nights usually start the morning at 05 hours local time (07 UTC when Brazil has summertime). During these perfect conditions almost all stations had signed on. It took over 80 hours to listen to all the recordings from this one hour! Samuel Cassio, the famous Brazilian DXer helped me in solving some mysteries. His work was so intensive, that still today I feel sorry about the workload I gave to him. But Samuel's help was simply fantastic! During that super hour I was able to hear 23 personal new Brazilians!!! At least 8 of them were previously unheard in Europe. What comes to reception quality, Radio Vale do Jaguaribe, Limoeiro do Norte, CE on 1260 kHz had a nice signal (almost always this frequency is blocked by Radio Morada do Sol from São Paulo). Well, you can't blame Radio Clube's reception quality either. Radio Clube on 1330 kHz is from Blumenau, SC. A great surprise was also the frequency 1530 kHz, from which it is extremely difficult to hear any Latin American stations. This morning we were able to log three Brazilians: Radio Tapejara, Tapejara, RS, Radio Porto Feliz, Mondaí, SC and Radio Sulina, Dom Pedrito, RS. 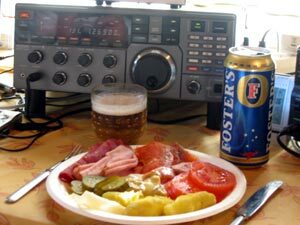 On 1580 kHz the greatest pleasures were Radio Pomerode, Pomerode, SC and Radio Encanto, Encantado, SC. Among these wonderful Brazilians I was able to hear Emisora del Este from Minas, Uruguay. Their reply was truly personal. Please listen the enclosed clip. This verification was possible thanks to the help of Henrik Klemetz, world's best Latin America DX expert. Henrik has been helping me so much during the past years, and Emisora del Este was no exception. After this wonderful Brazilian hour conditions started to shift to Cuba and USA. The total amount of new reception reports that day, the 28th December was an amazing 38! Some of these new ones came with absolutely perfect reception quality. Please have a listen to KINF Santa Maria, CA on 1440 kHz (never heard before in Europe) and KWEI Weiser, ID, 'La Caliente' on 1260 kHz (only heard a handful of times in Finland before). It was difficult for these stations to believe that they were received this well in Europe! At the end of February it was time to make our 10th joint DX-expedition with Håkan Sundman. Once again, it was a splendid week. On Wednesday, the 27th February we hit Australia again! During this solar minimum I spent 37 days in Lemmenjoki, and only twice was I able to hear Australian mediumwave stations well. But those two days gave me more than I ever expected. Some of the highligts on the 27th February were ABC Perth, Perth, WA on 720 kHz (local station identification '720 ABC Perth') and ABC Kimberley, Kununurra, WA on 819 kHz (regional station identification 'ABC Local Radio WA'). I also heard an interesting Aussie on 963 kHz with the programme 'Talking Back The Night'. This programme is produced by Macquarie Southern Cross Media Network and they own two stations on 963 kHz which broadcast it at night time: 5SE Mt. Gambier, SA and 6TZ Bunbury, WA. Since we heard also many SA (Southern Australia) stations, as well as many WA stations (Western Australia), it was impossible to know which of these two stations was in question. Nevertheless, a wonderful experience. Among Australians the band was filled with Chinese stations. For example Zhujiang EBS from Guangzhou had a splendid reception quality on 1062 kHz. Please enjoy their advertisement block on the clip. Also two Indonesian stations were heard: RRI Semarang on 801 kHz and RRI Singaraja on 1080 kHz. In the past 27 DX years I have heard only two Indonesian mediumwave stations (RRI Jakarta on 999 kHz and Radio Suara Jakarta on 1485 kHz). Now it was time to double that amount. To Maine, North America we experienced a wonderful 10 minute graveyard opening on the 24th February. WEZR Lewiston, ME and WSYY Millinocket, ME, both on 1240 kHz provided us fantastic reception quality. The dx-test from WBIX Natick, MA on 1060 kHz was a truly memorable experience, too. Everything good has to end, and so it was with DX-expeditions during this solar minimum, too. The very last station we heard was surprisingly Emissão Provincial do Niassa from Lichinga, Mozambique on 1260 kHz. Their high energy Friday night music programme was a perfect end to this wonderful DX season.